When they were building Minute Maid Park, it was said and written that Drayton McLane had them take lots of ideas from Oriole Park at Camden Yards, the home of the Baltimore Orioles and the first of the retro-style ballparks that have since swept through baseball. I have never liked Minute Maid Park. It’s too gimmicky. Too full of little tricks. Too plastic. It just tries too hard. And I’ve been to many of the new retro-parks – Coors Field in Denver, Jacobs Field in Cleveland, AT&T Park in San Francisco, Comerica Park in Detroit, The Ballpark in Arlington – and I’ve always liked those stadiums so much more than what Drayton had built with my money. But I was at a loss to really say why. Sure, there’s that stupid hill in center. There are the flagpoles that are in play. There’s the Crawford Boxes and the cheap homeruns. And don’t forget that idiotic choo-choo train loaded with giant pumpkins. But all of the other parks that I visited also have their quirks. Just what is it about Minute Maid that rubs me the wrong way? So, I went to Camden Yards this past weekend. And now I get it. Drayton had them copy the basic concept of Camden Yards: the dark green seats, the brick, the iron, the angles, the location of the press box, the basic shell for the seating. But he failed to have them capture the charm. Or the feel. The sense of the park belonging to the neighborhood. Camden Yards reflects Baltimore. Minute Maid Park fails to reflect Houston. Camden Yards belongs to its neighborhood. It is a part of it. The brick, the ironworks. The warehouse. Those are all a part of the neighborhood. Sure. You know that it’s a ballpark. But it looks like it has always been there. That it grew up with the neighborhood, and with the city. Minute Maid has the brick and the ironworks. But it doesn’t look like it is part of the neighborhood. It looks like some giant building that’s just been plopped down in the middle of a large piece of vacant land. It’s a stranger to the city. It’s too new. It just looks like it doesn’t belong. And that’s the thing with a lot of other retro parks. They look like they belong. 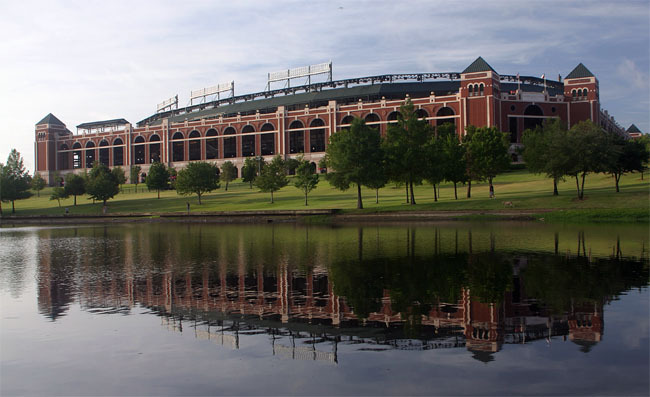 The Ballpark in Arlington sits alone in a large field, a large lake in front. It looks like you’re walking through a corn field in Iowa with a ballpark of legendary players trying to redeem Shoeless Joe. You can’t imagine anything else in that spot. The ballpark just has to be there, and nowhere else. Coors Field blends with the warehouses on the outskirts of Denver’s downtown area, the Rockies looming in left field. And AT&T Park sits on the water. It has to be there. Nowhere else would work. But Minute Maid Park is just a jumble of pieces that could be assembled at any location in Houston. Or Dallas. Or San Antonio. Or Los Angeles. Or Seattle. Or St. Louis. Or Miami. Or Atlanta. It fits anywhere, yet it doesn’t belong anywhere. It doesn’t become part of the neighborhood. But the outside of Minute Maid is not the only problem. Inside of the park is just as troubling. Forget about the travesties visited upon the playing field. Concentrate on the fan experience. You walk into Camden Yards and the outside world vanishes, even though the park is open and the Baltimore skyline is visible in left and center fields. There’s a quiet about the park, a feeling of tranquility. It’s all about the baseball. Everything inside the park exists to serve the baseball game. The scoreboard and video screen are large, but they blend into the field. There’s nothing screaming “look at me.” Minute Maid’s scoreboards and video screen are huge, looming over the field, but finding stats and scores are secondary to the need to make one look at the boards. They’re huge. Garish. They’re full of bright colors. They detract from the game. And the Astros would never do so much as put a scorer’s decisions on those boards. That would detract from the little games and ads. And Camden Yards is loud. But it’s loud because of the crowd. Music’s not constantly pumped at the loudest volume. The PA guy’s giving the player’s names, not wasting time with ad copy (nothing against the Astros PA guy, Bob Ford, who has the best voice that I’ve heard at any park). And though the Camden Yards crew occasionally asks the crowd for noise, it’s usually the crowd that starts a cheer. There’s no sensory overload in Camden Yards. You’re allowed to relax and to watch the game. You cheer when it’s time to cheer. There are no annoying pumped in noises. They want you to enjoy the game at Camden Yards, whereas the game in Minute Maid often seems secondary in Houston. The kiss-cam is more important than a replay. The buzzing bee is more important than allowing the crowd to reflect in wonder at a great play. But primarily, it can all be boiled down to one thing. Minute Maid Park is tacky. Every surface is covered with ads and colors. You look up to see a stock ticker and a beer ad. You look for the ball/strike count only to find a Macy’s ad. Camden Yards is full of ads. What ballpark isn’t? But they don’t jump out at you. They blend into the stadium. As if they belong with the brick and the dark green seats. Drayton McLane may have had them copy Camden Yards. But he forgot to have them add character. And personality. He forgot to have them make Minute Maid part of the city.